"I try and photograph my boat at least once a month, usually from the same vantage point. I’m making a record of the winter of her life. Sometimes, in my mind, I can see all the pictures bound together in order. And then I flip through them, quickly enough that the stills become fluid, like those old novelty books of horses running, or women dancing, and I can see then how it all comes together, or rather, how it all falls apart. Compress ten years into a few seconds and the inevitability of everything’s end is so clearly revealed." "Twelve miles long by a mile wide, Tomales Bay forms the eastern boundary of most of Point Reyes. Its often-tranquil air belies what runs beneath it, for the bay is in fact a submerged rift valley of the San Andreas Fault—the seam where the Pacific and North American plates meet. Study a map and it quickly becomes clear that Point Reyes, riding along on the west side of this divide, belongs at heart to the ocean. And someday may return to it. If only Tomales Bay were to make a final short push into Bolinas Lagoon, the peninsula’s tie to the continent would be severed, and Point Reyes would become an island." "Reaching the shore, I made for the southern tip of the crescent-shaped cove, down to where the cliffs turn to the ocean and then curl back to parallel the beach as a thirty-foot high seawall. Once, in the worst of a winter storm, I set up my camera there, on the landward side of the wall, daring myself to hold fast as the waves rumbled in like trains, like battalions. Don’t fire till you see the whites of their eyes…And then, after a concussion that sucked the air from my lungs, a wave would crest the top of that granite horizon, rearing into the sky like some colossal, winged demon—pausing mid-air as if to size me up—before finally collapsing under its own weight, half in front and half behind the bulwark. My camera got half-wrecked from the sea spray, but it was worth it for the memory." "I leaned out and looked down at the lilies. Each leaf was connected to another by a slender white stalk, the pattern repeated beyond count to form a vast web that looked every bit like constellations. And indeed, deep down in the water, with the lilies’ tangled roots, was a nimbus of decomposing matter like interstellar nebulae—overlaid with an apparition—the reflection of my face!" "Sunbeams are pouring down into Drake's Bay through cracks in the lingering clouds, forming coliseums of shadow and light that shimmer and turn for a breath, or two, then vanish. Three white fishing boats bob in blue-violet waves. A rainbow lights over the distant green hills, flickers a little, fades, then shines forth again, twices as bright as before. It's all so beautiful I can hardlly stand it." "The Miwok Indians who once lived here considered Point Reyes to be the abode of the dead. That seems about right to me. There is a feeling that overcomes those who wander here, as I have on innumerable days, that the peninsula stands somehow outside of everyday experience. It is otherworldly, this place, or rather, it seems neither here nor there, but someplace in-between. It is a difficult thing to define. I know only that nowhere else on Earth have I so strongly sensed the immanence of the spirit. And I am not the only one." "I set up my tripod and folded my hands over its head, leaning there, letting it support me so that I could be as still as the world. The water was so smooth it looked frozen over. Not a single thing was moving as far as I could see. And all was perfectly quiet. It hardly seemed possible that a wild place could be so reposed. The landscape, emptied thus, gained the quality of architecture, of an ancient cosmos of temples and monuments; Thebes or the Taj Mahal. The Point Reyes was a weathered limestone sepulcher, a vessel for the next life. Black Mountain lay to the east like a stone fist, like a sphinx paw. And I, I was a statue of a man leaning on his tripod." "Soon I’m at the big white park service house. The commander of the lifeboat station used to live here, a long time ago. The station is still down there on the bay, though it hasn’t been used as such for years. Back when it was active, they’d launch the lifeboats with a marine railway. The tracks ran from inside the building right down into the water. The men stationed there saved a lot of ships. Some of them died trying. They’re up in the cemetery on the hill, with the eucalyptus and the cows." "I scrambled up a break in the cliffs to a place I know. There, on a level shelf overlooking the ocean, sits the sole remnant of the old lifeboat station. It is a little boot-shaped building, with peaked roofs and white shingles and so many windows they nearly cover the lower level solid. It looks like a wayside chapel. In fact though, the structure once served as a Navy compass station, receiving and transmitting signals from ships at sea. It’s been abandoned for a long time. A side porch with half its supports collapsed droops down onto a mat of ice plant. In places the white shingles are beginning to slough off, and the dark, bare wood beneath wraps one corner like a spreading stain, or a slow, consuming fire. All the window glass is frosted from years of weather and neglect, laced now with sea salt filigrees and streaks of guano." "Almost a year to the day after the water heater, and in nearly the same spot, I found an airplane wheel. It must have weighed hundreds of pounds, and yet, it stood there perfectly upright, as grave and mysterious as Stonehenge. 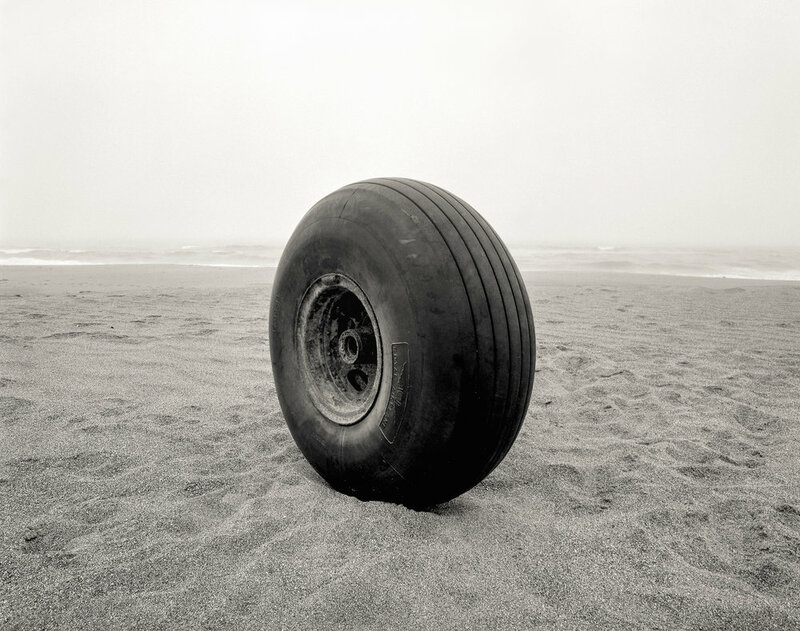 Just another Point Reyes mystery I suppose: why is there an airplane wheel on the Great Beach? And what happened to the airplane?" "A line of elk streamed across my path, as silent and fluid as a school of fish, then disappeared behind the trees. 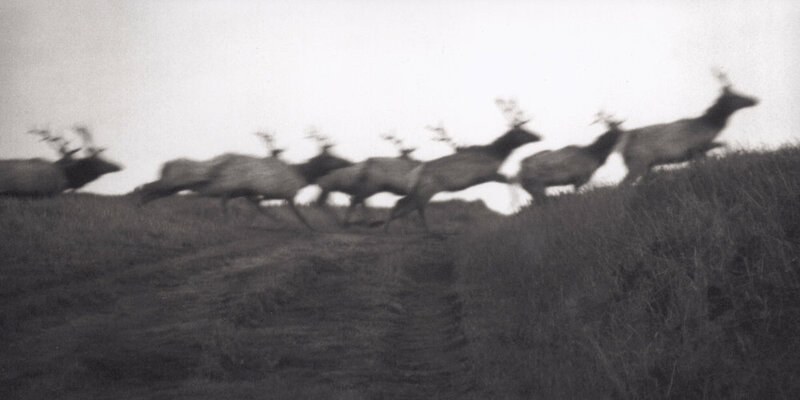 They seemed more ghosts than elk. Did that just really happen?" "Inside it smelled of wet earth and camphor. I could hear the sound of the leaves rattling. The ground was covered with bright green grass made greener, it seemed, by the tree’s pale trunks. Broken boughs lay everywhere; eucalyptus drop parts of themselves like it was nothing. I bent down and gathered up a handful of dried gum nuts. They looked like little sleigh bells. I brought my hands to my face, inhaled, and the memories of a dozen other days flooded in. The place really was haunted."